The Ducati Panigale V4 R is the world superbike class motorcycle featuring a 1,000 cc version of the Ducati Panigale V4. The Ducati Panigale V4 R is the downsized, 1,000 cc version of the Ducati Panigale V4, and will be Ducati’s weapon of choice in superbike racing for some time now. The current Panigale V4’s 1,194 cc engine overshoots the displacement limit for the World Superbike Championship (WSBK) for four-cylinder models, so an engine meeting the WSBK homologation requirements was imminent. Latest spy shots show exactly such an example of the V4 R undergoing test runs at an undisclosed location. The bike seen in the spy pictures appear to be the race-spec variant of the new model, although Ducati will certainly introduce a road-legal model of the V4 R as well. 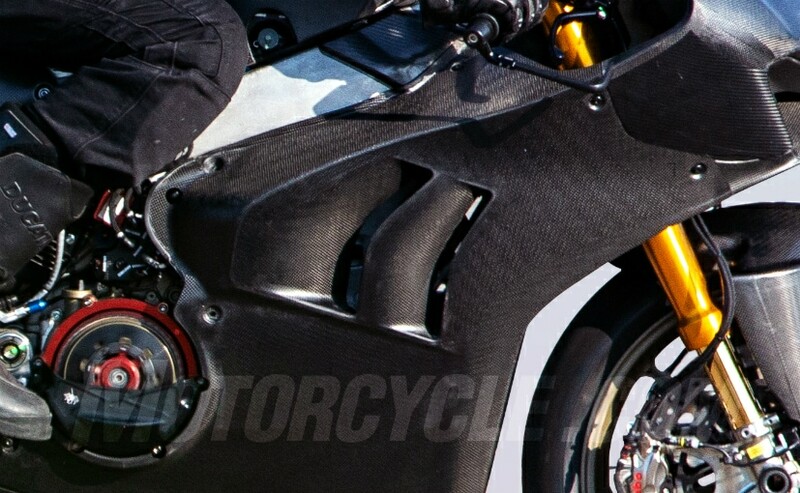 The spy shots reveal that the V4 R has a different fairing design than the Panigale V4, with a pair of gill-like openings on the side (quite like the BMW S 1000 RR). The fairing also has a number of mounting points that may be used for adding winglets which are now allowed for WSBK racing. Also seen is a dry clutch on the test bike, although this clutch could only be available on the race-spec bike, rather than the street bike. The test bike also sports lightweight magnesium-forged Marchesini wheels, and what seem to be Brembo brakes. The spy shots also reveal a reworked exhaust system which seems to be more compact than the stock exhaust system on the current Panigale V4. So far, there’s no indication when the V4 R will be launched and what its pricing will be. The production-spec model of the Ducati Panigale V4 R is expected to be unveiled at the EICMA show in Milan next month, followed by the model’s launch in Europe. We expect Ducati India to introduce the road version of the V4 R in India sometime next year.